Derawan Dive Lodge consisting of Balinese style rooms idyllically positioned on the white sandy beach with a myriad of exceptional diving spots on the doorstep welcomes you to paradise! The NAD’s location, knowledgeable staff, beautiful house reef, personal service is perfect for all and with divers to guide ratio of a staggering 2:1 makes it a haven for photographers. Alam Anda is located at the beautiful beachfront with many exciting adventure excursions on offer as well as access to the relaxing spa and wellness area. The Wakatobi Dive Resort is an intimate and luxurious hotel located in remote southeast Sulawesi. This tropical paradise offers out of this world diving and should be on every divers bucket list. Villa Almarik is set on the tranquil island of Gili Trawangan, a picture perfect resort encircled by underwater coral gardens and blessed with gentle giants such as sharks, manta rays and turtles! Lembeh Resort offers guests fantastic rooms with breath-taking views, this wonderful destination is the perfect spot for critter and muck diving and underwater photography! Choose the best of the best. This liveaboard is very well appointed and provides guests with a high level of service in an aesthetically pleasing environment. You can dive at sites not available from the Wakatobi resort. The Mermaid 2 offers great 8/10 night trips around Bali and Komodo. The diving in this region is very diverse and you can encounter animals from the smallest seahorses to the giant Sunfish. The Mermaid 1 offers 9 night trips around the Bali and Komodo area. The diving in this region is very diverse. 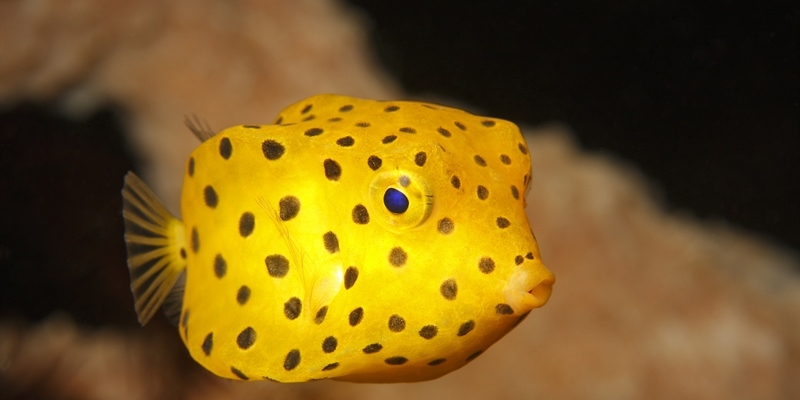 You can encounter some great animals from the smallest seahorses to the giant Sunfish. The Raja Ampat Aggressor is a 30 metre boat offering 7, 10 and 12 night itineraries departing from various ports on the Raja Ampat, Banda Sea, Cenderawasih Bay and Triton Bay route. Every time you visit a country you will see a different kind of people with their own cultures and art. North Sulawesi has been known as ‘The Land Of Smiling People’ and we will prove this to you while we show you around the highlands. Feel the cool mountain air far from the hustle and bustle of everyday life. We start this trip - where we visit a number of sights - at 8:00AM and the duration is about 9 to 10 hours. For those who like shopping, we will take you to the other side of North Sulawesi Island. You will visit a souvenir shop but we also have some other interesting places to show you. This trip takes around 6 - 7 hours. This tour is perfect to do on your last day when you are off-gassing for your flight back home on the following day, as we leave the resort at 1:30 PM - so you will still be able to do the 1st dive!!! On this trip we take you to Tangkoko Duasudara Nature Reserve where you can see a variety of wildlife. A full day, 10 hour tour discovering lakes, markets and temples. Experiencing cultural and nature in one day is the perfect way to get the most out of your Indonesian Trip. Today’s tour begins with a visit to Klungkung Palace, also known as Puri Agung Semarapura. The Kertagosa Pavilion is one of the best-preserved parts of the palace and an excellent example of traditional Balinese architecture. Today’s full day trip is a diverse one, taking in stunning landscapes, traditional arts and crafts and temple culture. Your first stop is at Tohpati, where the batik fabrics for which Bali is famous are painstakingly created by hand using traditional techniques. Drive north to Bedugul Regency (district), part of the island’s central highlands region renowned for its stunning beauty and three caldera lakes (Beratan, Buyan and Tamblingan). 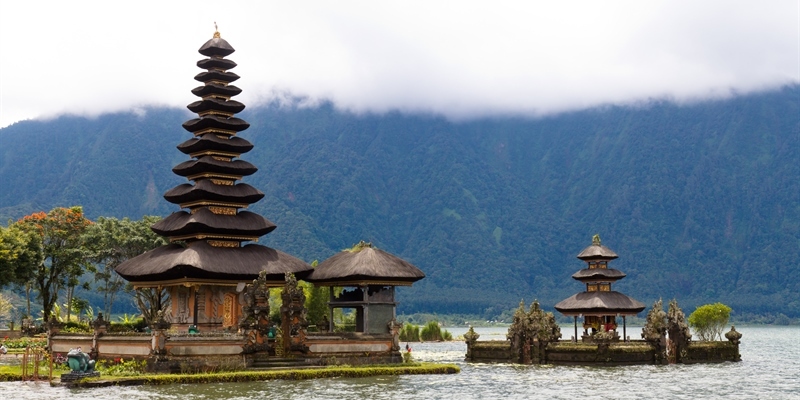 Firstly visit the iconic Ulun Danu Temple. This important Hindu Shivaite water temple is located on a small jut of land within the calm waters of Lake Beratan. Travel to the southern-most tip of Bali to visit the famous Uluwatu Temple (*). One of seven sea temples that are said to form a ‘chain’ around the island, it is undoubtedly one of the region’s most venerable places of worship. Your excursion begins with a drive into Central Bali and small town of Mengwi. Long associated with the Balinese Royal Family, Mengwi is home to the superb temple complex at Taman Ayun. Translating as ‘beautiful garden’ Taman Ayun is considered by many to be one of the island’s most attractive temples and is still used today by people from all over Bali for special ceremonies and events. Today’s journey takes you via a local coffee plantation to the village of Kintamani. This is the best spot, weather permitting, for views of Mount Batur, an active volcano which sits alongside Lake Batur. Art, sculptures and the magnificently located Uluwatu Temple. The first stop today is the Museum Pasifika in Nusa Dua. Established in 2006 by a group of like-minded Indonesian and French with a passion for art, the museum not only showcases pieces from countries located within the Pacific Ocean (as the name might suggest) but also from other regions of the world. Off-road excitement in the central highlands. Your transport for today’s excursion will be the FIN Komodo, an Indonesian built buggy-style vehicle designed for off-road terrain. See off-the-beaten-track Bali in a 4X4 Land Rover. Using customised Land Rovers as the mode of transport, today’s excursion goes off-road and heads into the superb countryside surrounding Gunung Batukaru, Bali's second-highest mountain. Explore the Balinese countryside by mountain bike. Take to two wheels today and discover the glorious Balinese countryside by mountain bike. Using branded bikes and equipment, your adventure will begin with a vehicle transfer to the start point of your desired route and will include the services of an English speaking guide throughout. Experience an 8 hour tour showing you Balinese culture and a monkey forest with transport included. The day will start with a fascinating performance of Barong Dance. In Balinese mythology Barong is a lion-like creature and King of the Spirits and this colourful dance depicts the eternal struggle between good and evil as he battles (and eventually defeats) his arch enemy, the demon queen Rangda. Continue your exploration of the Balinese arts with a stop at three villages near Ubud known for their arts and crafts. Take two wheels and two feet today and discover the glorious Balinese countryside by cycling and trekking. Begin your day after breakfast by pick up from your hotel in Ubud and driving up by car (shared transfer) to Kintamani. Go on a culinary journey with a local “foodie” to experience the aromas and flavors of Bali. In the afternoon you will meet your local food specialist guide and drive to a traditional Balinese house at the outskirts of Ubud. Volcanic vistas and a freshly cooked meal. This moderately challenging afternoon walk takes you through the moon-scape of various lava flows and ashcones created by the more than twelve eruptions of Mount Batur between the periods 1963 to 1999. Feast your eyes on stunning natural beauty.. lakes and temples experiencing true Indonesian culture. This excursion begins with a drive north to Bedugul Regency (district), part of the island’s central highlands region renowned for its stunning beauty and three caldera lakes (Beratan, Buyan and Tamblingan). Today you will have the great opportunity to meet and interact with Balinese people and experience how families live and work together in their natural daily environment. A 2am departure is essential this morning as you drive then hike up to the summit of Mount Batur, where you will arrive in time for sunrise. Glorious trekking and spiritual experience in one of Bali’s remotest regions. Start the tour early from your hotel and enjoy a comfortable scenic journey along country roads to the Tabanan area in the remote region of Belimbing. Explore the island’s temples and natural beauty in a classic Volkswagen convertible. Your transport for today’s trip will be in the classic VW 181 convertible, an off-road vehicle originally manufactured by Volkswagen for the West German Army in the late 1960s. Overlooking the Ayung River in Mambal between Seminyak and Ubud, a hidden gem awaits the intrepid. Beginning early in the afternoon as the sun slowly sinks over the hills and bathes the area in a dazzling light, visitors will be treated to a sublimely picturesque High Tea experience. Explore the chocolate making process from te cocoa tree to raw cacao, fermenting and roasting of the beans, and the final transformation into delicious Pod Chocolate. Today experience the thrill of whitewater rafting on the Ayung River. The approximately two-hour long water adventure begins with a transfer to the start point followed by a safety and equipment briefing given by your expert instructor. With a vibrant culture, intricate architecture, and lush ecosystem, Bali is one of the most photogenic environments on the planet. The Balinese people are generally happy to be photographed; however, there is an art to relating in a way that illuminates the spiritual essence of a people and place beyond a snapshot. Arrival in Tarakan, transfer in to Swiss Bell Tarakan, overnight. Get a taste of local Minahasan cuisine by learning how to prepare a variety of local dishes with one of our chefs. Tasikoki rescue animals from the illegal wildlife trade with the aim of rehabilitating and releasing them or finding suitable placements. An ideal tour for nature lovers and photographers. Our Minahasan Highland Tour is a perfect way to explore the area and learn about the local culture and history of the region. We can tailor the tour to take in the sights that are of most interest to you. This Volcano tour is an adventurous trek. Picture-perfect beach and delicious BBQ lunch on Lembongan Island. The journey begins when pick you up from your hotel and drive you to private marina at Benoa Harbour, where you are welcomed aboard on 16.6 metre luxury Catamaran, Waka Sailing for a day of sailing, relaxation and fun. Explore temples, caves and markets near Ubud, Bali’s cultural heartland. This interesting excursion begins with a visit to Goa Gajah in Bedulu near Ubud. Often referred to as the Elephant Cave, it was established in the 9th century as a sanctuary for Buddhist monks. The facade of the cave is noted for its interesting carvings and ornate relief. Fun and relaxation in Nusa Dua..
Fun and excitement is the aim of this excursion. You will be collected this morning and driven to Tanjung Benoa, a white sandy beach in Nusa Dua. Discover Ubud, the island’s cultural heartland. Located in the foothills of Gianyar Regency (district) and surrounded by ravines, dense forest and picturesque rice paddy fields, Ubud is one of the most attractive towns in Bali and a ‘must-see’ for anyone visiting the island. Learn to cook traditional Balinese cuisine.. Enjoy a cookery class that offers an insightful introduction to the unique culinary heritage of Bali and the exotic ingredients it uses. Enjoy delicious seafood cuisine at Jimbaran Bay. The delicious seafood rijstaffel (selection of dishes) and ambient beachside location provide the perfect end to a perfect day. Enjoy the unique experience of releasing a newly hatched turtle into the ocean. This afternoon’s excursion begins with a drive into Central Bali to the Alas Kedaton Monkey Forest. Learn the craft of silversmithing and design your own jewellery. Bali is renowned for its silver craftsmanship and today you will have the opportunity to learn about the art form and put new skills into practice by crafting your own piece of unique jewellery. Prepare Balinese cuisine in a delightful rural setting. Discover the unique flavours of Balinese cuisine in a cooking class that offers a fascinating introduction to the exotic ingredients and unique culture of Balinese food. Trek through wonderful countryside and traditional villages near Ubud. Today your walk passes through the river valley of Tukad Wos, offering fine views of the stratovolcanic mountain Gunung Agung and glimpses of small village communities and rice fields along the way. Rivers, Oceans, Lands, Ecology (R.O.L.E.) Foundation is a not-for-profit humanitarian organization based in Bali, whose aims are to promote environmental awareness and empower women. Destination Asia Indonesia participates as Educational Partner for the R.O.L.E. Foundation as part of Destination Asia’s generous CSR Program. 6 Activities to do in the national park! 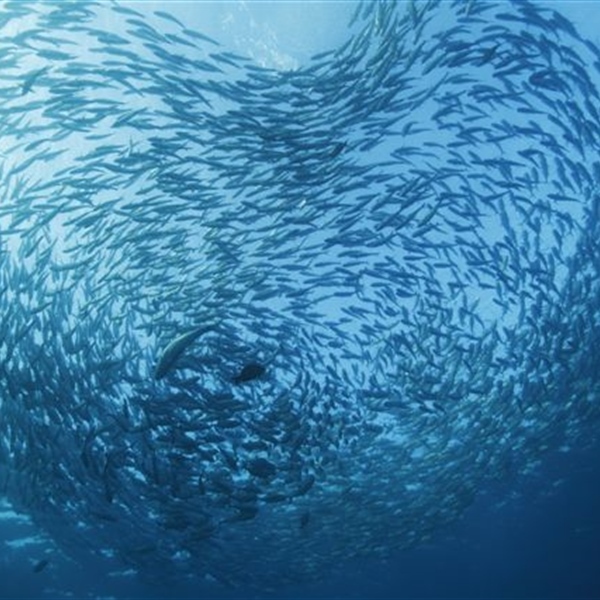 Coral reefs and fish are important resources that are the focus of TNW management. Coral reef ecosystems are considered as highly productive coastal marine ecosystems that can be found in tropical waters. Jetty spa with stunning views of Dampier Strait and a wide range of spa services. An active morning adventure, white water rafting! Why not soak up a sumptuous spa on your stay at Wakatobi? East and West come together at Wakatobi’s spa, which blends the best of Indonesian and European traditions. The park spreads over 280 acres and is made up of two parts; the zoological and the botanical side. The park's goal is to create a family-oriented park and has a children's zoo as a main attraction. Among the many residents of the zoo are the Borneo Pygmy elephants, Sumatran rhinoceros, Orang Utan, Proboscis monkey, Malayan Tiger and deer. Visiting the Poring Hot Springs in Kinabalu Park will make your visit perfect. Situated 25 miles northeast from the Parks HQ, Poring is located in the lowlands. De-stress and soak your muscles and aches in the spring’s hot sulphuric minerals. The springs are told to have healing properties and a very popular location for the locals. Batanta Island is a beautiful island around 30 minutes by boat from Papua Paradise Eco Resort. Leaving at 8am the tour starts with a short walk through the mangroves to a small but beautiful waterfall. One of the world’s most remote kite spots with miles and miles and miles of shallow flats, reef breaks, beach breaks and untouched expanses of tropical bliss. Dive with the infamous Sunfish in the day and indulge in the nightlife culture in the evening. Our boutique resorts will make this a trip to remember. The Gili’s are not as developed as neighbouring Bali and offers a different diving experience with walls and pelagic fishes. There is plenty to see outside the resort with local tours. Manado is the gateway to Bunaken national park and also a good base for doing diving trips between Bunaken, Banca and Lembeh. Great value resorts available. This is the place to visit for critter diving. The black volcanic sand has caused animals to evolve in a way that is unique to this destination. Some great local excursions on offer as well. Siladen is only 5 minutes from the Bunaken national park. If you are looking to get away from the crowds and enjoy a bit of luxury this is the place for you. Good for multi-centre holidays. Probably one of the most diverse diving environments in the world. Choose from a premium resort or liveaboard to enjoy your diving or combine both to make a mind blowing trip of a lifetime. Borneo is the least visited part of Indonesia, enabling it to stay truly unspoilt! Both above and below water the nature of this region will leave you astounded. 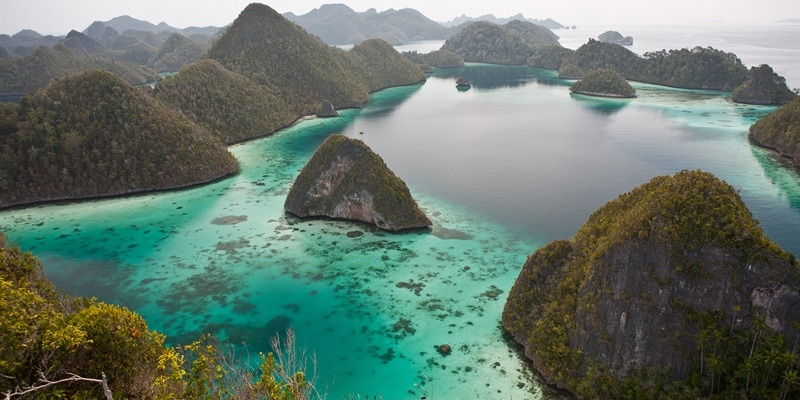 The marine life in Raja Ampat ranges from the largest manta rays to the smallest pygmy seahorses. A complete menu of macro and pelagic action for the keen photographer. 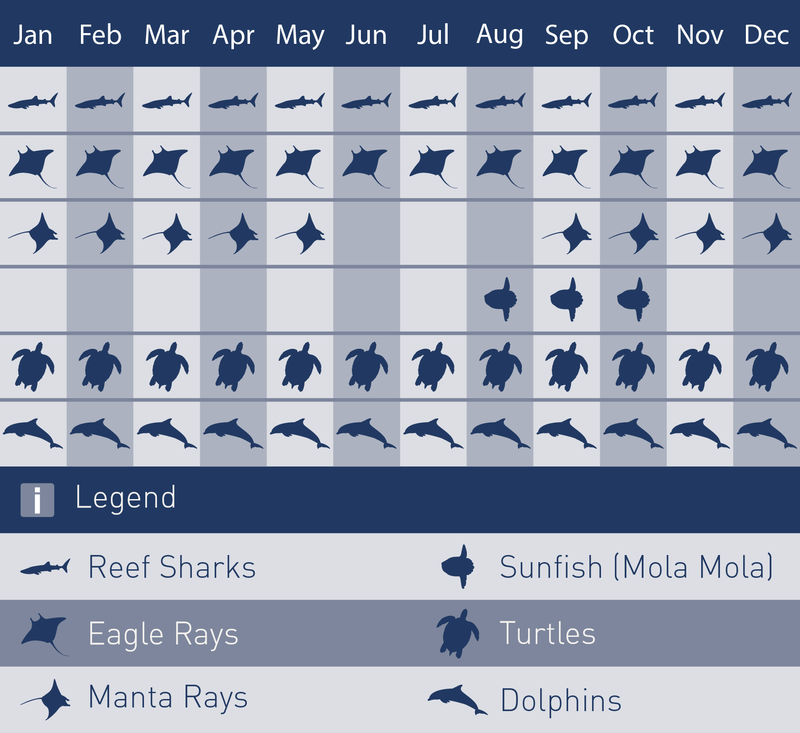 One of the most varied diving destinations in the world. The huge choice of diving, liveaboard and resort options are enough to keep the most discerning diver interested for weeks. There just are too many highlights to mention! Indonesia is one of those diving destinations that just has so much variety on offer, located in the middle of the “Coral Triangle” your diving adventure will include beautiful wall dives, healthy coral reefs and pelagic action. 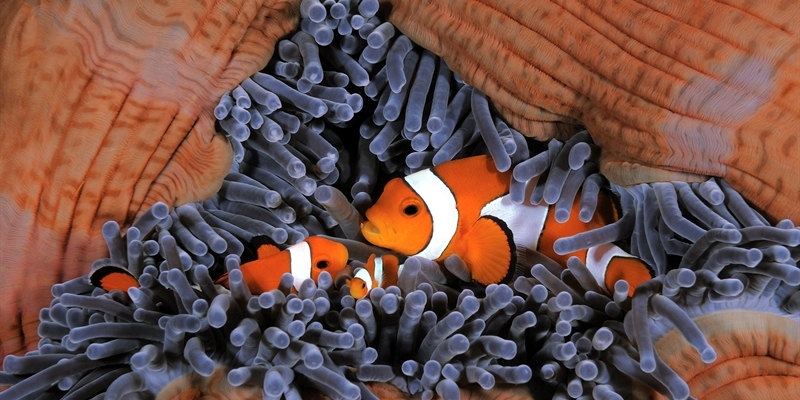 In our opinion a destination that has more marine diversity than anywhere else on earth. Indonesia is the perfect destination to do a twin centre diving trip as you can easily visit a couple of diving areas and have a totally different diving experience. 7 nights at the Lotus Bungalows in Bali organised by Marcelina at ultimate diving. Generally accepted to be the world's best country for sea life, Indonesia has more marine diversity than anywhere on earth. Slap bang in the middle of the 'Coral Triangle' of diversity that extends from Australia to the Philippines and across to Borneo and into the South Pacific, this country is at the core of the ocean's heart, where the marine variety suggests life in the sea began. With 20% of the world's coral reefs, over 3,000 different species of fish and 600 coral species, deep water trenches, volcanic sea mounts, World War II wrecks, and an endless variety of macro life, Indonesia scuba diving is both excellent and inexpensive. 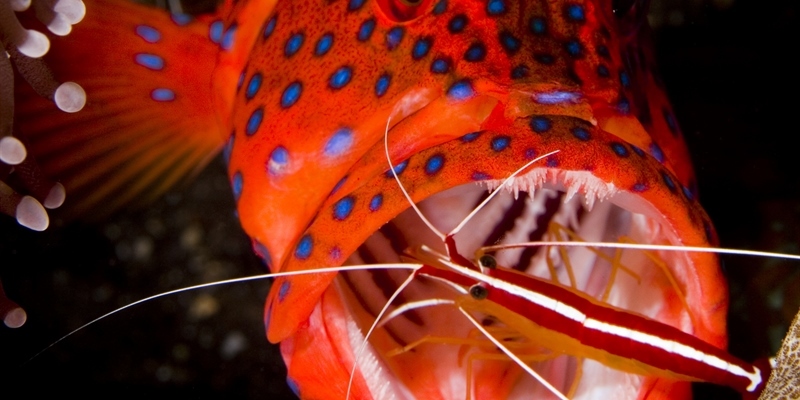 You can experience all the wondrous fish and other marine life in these nutrient-rich seas. From encounters with big pelagics around the cool waters of Komodo, cruising over pristine fields of coral in Raja Ampat, marvelling at the enormous volumes of fish in the Banda Islands, to photographing the outrageous critters of Sulawesi, diving in Indonesia is unforgettable. There are packages to suit all needs including resort diving in Bali and Sulawesi where you can stay in comfort on the doorstep of world-class dive sites where marine biologists, photographers and pleasure divers come to marvel and the species numbers and variety. For many, diving is best on one of the Indonesia liveaboards to Komodo and beyond, into the seemingly unchartered territory of Papau. These trips offer the chance to cruise over crystal seas from Bali to the legendary islands of Komodo and Rinca where the dragons of folklore roam. Beyond Komodo lies some of the most exhilarating frontier scuba diving there is, around the Banda Islands and Raja Ampat where there are few boats and only serious pleasure-seeking divers. Fantastic dives are virtually assured. Bali's diverse dive sites offer an exceptional diving experience for all levels of divers experiencing protected shallow bays with exotic scorpionfish, octopus and nudibranchs to exciting drift diving in wild currents with sharks and manta rays. From Bali you can embark on one of the liveaboard trips Ultimate Diving offers to the Komodo National Park and East of Flores onboard the Komodo Dancer giving you the opportunity to explore the waters in and around the Flores Sea, vibrant local cultures, the Komodo Dragons and colourful coral reefs. Lombok’s diving is around the many reefs, walls, drop-offs, plateaus and slopes reflecting a good cross section of what Indonesia has to offer. Here you will have the opportunity to see a fascinating variety of turtles, white tip reef sharks, cuttlefish, moray eels, angelfish, ghost pipefish, snappers, mantas, eagle rays and many more. The corals around the Gili Islands are good for diving and snorkelling activities and can be reached from shore. The three islands have spectacular white sandy beaches, sparkling blue waters and are encircled by beautiful coral reefs containing very rare blue coral and thousands of species of marine life. 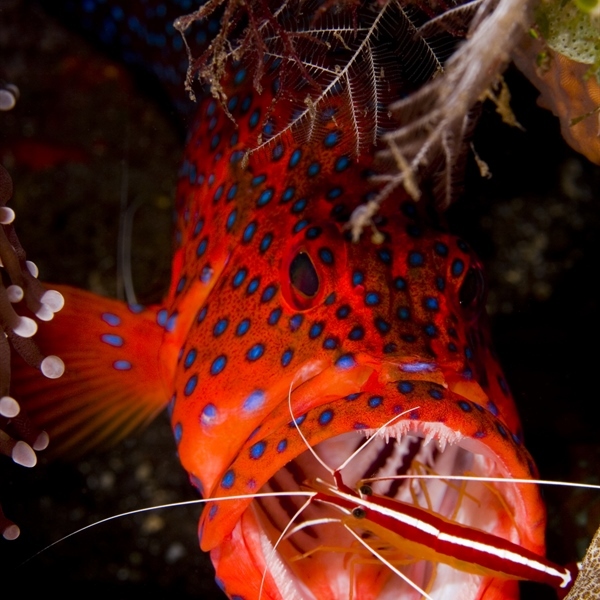 vv Manado’s marine environment is the most varied, rich and incredible diving in the world. The seas are fringed by extensive coral reefs and surrounded by a very rich marine bio-diversity. The Bunaken National Marine Park is the main diving area in Manado and comprises of a group of five islands: Bunaken, Siladen, Nain, Montehage and Manado Tua. The islands in the park are distinctly different; in Bunaken you will have the opportunity to dive the deep and calm bay that shelters fertile coral formations. The fauna on this reef flat, edge and wall is extraordinary and large pelagics patrol along the steep walls. The Lembeh Strait has decent coral meadows to the north but it is mostly famous for being one of the best muck diving destinations in the world peeling back layers of life to reveal shy critters such as the flamboyant cuttlefish, harlequin shrimp, mimic octopus and skeleton shrimps. The Lembeh Straits are 25 kilometres long with over 30 dive sites to choose from and its seabed is as diverse as the creatures which inhabit it. Gangga Island is perfectly located at the conjunction of the Indian and the Pacific Oceans offering sensational diving where you will have the opportunity to get up close and personal with diverse and remarkable marine life. The Bunaken National Marine Park is only 75 minutes away from Gangga Island and the 75,265 hectares of the protected park offers most of the species of coral fishes known to exist in Indonesia. Siladen Island is another amazing island part of the Bunaken Manado Tua Marine Park offering steep wall diving and many opportunities to see pelagics like sharks, mackerels, tunas and turtles. The sites around Siladen’s south wall and Siladen Utara offer swift currents supporting giant coral trees and sponges and a variety of exquisite soft corals at the reef top. Small creatures are common here and you will have endless opportunities to encounter groupers, butterflyfish, stingrays, and spotted eagle rays. Wakatobi is one of the newest and most exciting diving destinations in Indonesia. Biodiversity is a measure of the variety of species that can be found in an ecosystem. Wakatobi is located in an area that encompasses the highest coral reef biodiversity in the world. This destination has a spectacular house reef and several dozens of easily accessible dive sites offering incredible colour and natural splendour sightings. The resort packages include all boat dives and unlimited shore diving ensuring you get total diving freedom. Diphtheria; Hepatitis A; Tetanus, Cholera; Hepatitis B; Japanese Encephalitis; Rabies, Typhoid. Yellow fever vaccination certificate required for travellers over 9 months of age arriving from countries with risk of yellow fever transmission. Is not mandatory. However, if you want to tip, perhaps provide 5-10% of the total bill. Restaurants: some restaurants will include 5-10% service charge to their bill. Your passport should be valid for a minimum period of 6 months from the date of your departure. You don’t need a visa to enter Indonesia for visits of up to 30 days. Flights from Heathrow to Jakarta via Dubai. Average flight time is around 24 hours. These will vary based on different routes. When you land in Indonesia you will have someone waiting for you to take you to your liveaboard or hotel. You can dive in Indonesia at any time of the year. Generally speaking for such a vast country, April to December are the best times to go since rainy season is more or less between the months of January and March. 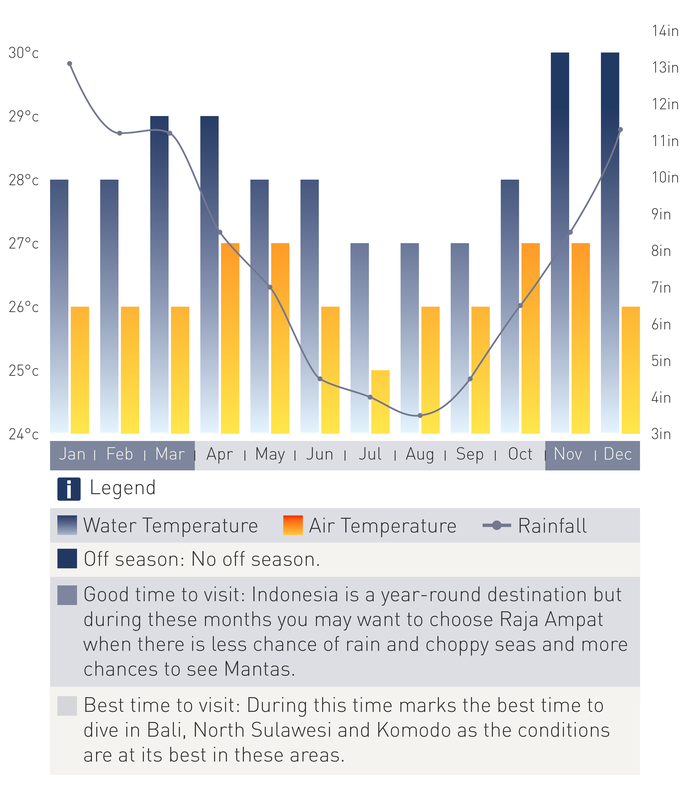 That said many places, such as Sulawesi, have excellent conditions at this time so be sure to check the diving season details for your particular destination of choice. The Indonesia liveaboard safari season is all year round. Applicable to continuous night stay. Stay 5 nights pay 4 nights. Book your Indo Aggressor with Ultimate Diving and save 25% on the below listed weeks. Save on your summer trip to Indonesia, Kungkungan Bay Resort & Spa travelling from June 1st to July 31, 2018. Valid for stays between 19th of May to June 30th 2018 Book 7 or more nights and get 10% off accommodation Package includes accommodation in selected villa type, full board 3 meals a day including water excluding beverages, all local taxes and wi-fi. Bunaken National Marine Park entry fee of RP 150,000 per person not included and payable upon arrival at the Resort. Get 10% off in accomodation. Spend your New Year’s Eve in Bali! Your 10-day stay can also consist of a combination of at least 5 days at the Alam Anda & Siddhartha respectively. The approx. 25-minute transfer between the 2 hotels is free of charge. Festive season offer in Bali! The special hotel program presented during the festive season at the Siddhartha will spoil you, check this offer and if it makes you smile then you should book today with us! Xylophone orchestra & Balinese dance. Do you fancy spending the festive season in Bali? This is the perfect offer for you! Alam Anda Ocean Front Resort And Spa are waiting for this this festive season! Combine any 2 or 3 resorts & receive 5% discount. Siladen Resort - 5 nights/ 8 Dives - Garden View Villa - Room upgrade: Beach View Villa £183- Luxury view villa £356. Upgrade Nitrox £43. 10 boat Bunaken boat dives. Free 5-night dive or down dive. Free daily special cocktail from bartender. One extra night & diving USD150 per person, per night. 7 nights – 5 days diving (full board) – Free place- pay 5 get one free. Get saving on this special offer. Dive show offer with Tasik Divers! 10 days/ 9-night Combo Bali – Komodo Package USD 1.350 per person minimum 2 divers. Dive into Lembeh: 5 night in a Seaview Villa twin/ double sharing 8 boat dives by a speedboat, Additional one tank Diving USD50. Price based on double occupancy. Single supplement please enquires. This package cannot be used in conjunction with any other special offers or priori books. Combo package 10-night 8 days diving USD1500 per person.